Saint-Egrève, France, April 2017 — Vi TECHNOLOGY, a leading provider of inspection solutions for PCB assembly, will exhibit at NEPCON China, scheduled to take place April 25-27, 2017 at the Shanghai World EXPO Exhibition & Convention Center. The company will exhibit with three of its manufacturers’ representatives – WKK (Stand 1F50), AmericanTec (Stand 1H48) and First Tech (Stand 1G50). Vi TECHNOLOGY will display its 5K3D AOI coupled with the PI Series 3D SPI and SIGMA Link to create a complete inspection solution for smart factories. 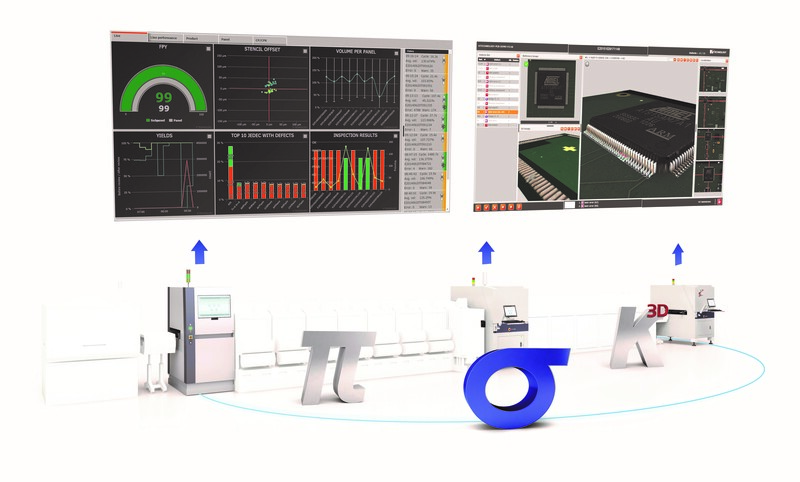 Vi TECHNOLOGY’s innovative process improvement software, SIGMA Link, coupled with two high performance systems, from the PI Series (3D SPI) and K Series3D (3D AOI) product families, introduces a new era in process control. The result is one integrated solution for automated optical inspection, with a live link between systems and smart interface to really improve your SMT process and productivity. The new 5K3D is a 100 percent 3D AOI based on laser technology with angled cameras combined with the 2D Spectro optical solution. This new patented 3D AOI combination offers complete defect coverage with high precision metrology. The awarded PI Series 3D SPI offers new horizons with programming-free software and unprecedented accuracy for small pads. These two measurement systems are the prerequisite for actionable data and process control.